Varies according to location and clients requests. LOVE ELVIS! Get Randy Elvis Walker..."The Voice of Elvis" to perform at your next occasion. His authentic, energetic, exciting and electrifying "HUNK OF BURNING LOVE" along with his interactive shows, serenades all occasions. Treat yourself to being married legally by Elvis Las Vegas or Hawaiian Style, Traditional, Conventional or your favorite style created just for you making your day very special and memorable. Performs at Performing Arts, Concert Halls, Hard Rock Cafe's, Resorts, Private events, Corporate functions, Dinner Shows, Hawaiian Luaus, Cruises, you name it... and he will bring the king live to your event. People feel like they're in the room with the one & only when he sings. If you are in need of a true entertainer then look no further. My wife and I hired Randy to help my dad celebrate his 80th birthday since we live on the West Coast and were unable to attend the event. He was extremely easy to work with and very courteous and professional. The event went off with no problems, even cross-country; so do not hesitate at all in organizing an event with him. He offered the option to provide a video taping of the event, which was fabulous, as it really helped us to appreciate his concert as well. A talented singer and performer, he really put forth tremendous effort to center the evening towards the guest of honor and placed loads of energy in it, as if entertaining to a crowd many sizes larger. We received calls immediately after with partygoers commenting on how wonderful Randy made the event. He brought so many smiles and laughs to others in that time and even several tears of joy to a few of us in appreciation of his remarkable performance. Randy, Elvis truly lives on through you. You definitely keep his spirit alive. From California, we thank you for being there. Hello Alvin & Belle! Thank you very much for taking the time to write your Review. It was my pleasure meeting and performing with your family. They are AWESOME and fun to be with. The Guest of honor was AMAZING at his age. Everyone made the time fun and very special. Thank you very much for choosing me as your Elvis. Randy Elvis Walker. Absolutely authentic you will NOT be disappointed! Randy Elvis Walker is the real deal! An absolute professional entertainer on every level. His love and dedication to preserving the memory of the KING shines through in his performance. His attention and interaction with his audience is clear from the consist applause and screams from the crowd. You will not be disappointed. Thank you very much for taking the time to write a review Sheila. It was my pleasure meeting you and your wonderful family and friends, and to perform for you and with you all. You all made your party a success with your interaction and response to me. Thank you! Thank you very much! Wishing you a "HAPPY BIRTHDAY" TODAY (Your official Birthday) and always filled with love, happiness and good health. Randy Elvis Walker is Absolutely AMAZING !!! surprise for my wife. He was absolutely AMAZING!!! He arrived early and was very passionate about every detail being the way I wanted. Mr Walker was very professional in following up with me prior to my wedding. His showmanship, his charisma, moves, voice and stage presence made everyone feel as if they were with Elvis Presley himself. Everyone called the next day to ask where did I find Randy Elvis Walker and that they were mesmerized by his personality and performance. Thank you Randy Elvis Walker for a AWESOME performance. I will recommend and rehire Mr. Walker without hesitation. Congratulations on your very special and beautiful wedding! May you have a lifetime of love and happiness together. Thank you very much for your comments and for making me a part of your special day. It was my pleasure and a delight to work with you and your wife. Elvis surprised my wife of 52 years. Surprise entertainment for my wife for our 52nd anniversary. 12 Bunco ladies group at our home. Total surprise entrance by "Elvis". Great singer and the ladies loved it. Provided us with video. Randy, thank you, for taking the time to write a review of my performance. Your wife and the ladies were lots of fun. They responded and interacted with me and were very hospitable. The ladies all all together made the evening a success. Thank you! Thank you very much! Randy Elvis Walker. Thank you very much for selecting me as your Mom's Elvis. She was a delight to be with and lots of fun too. Everyone mad the time made the time very special and lots of fun. Thank you for taking the time to write a Review. MY FAMILY HAD AN AMAZING TIME!!!! Welcome to Florida and I wish you and your family all the best! Thank you very much for making me your Elvis. It was my pleasure meeting you all and making Kathy's day very special for her. Thank you for taking the time to write a review. Randy Elvis Walker is a gentleman and an amazing Elvis. Arrived on time. We talked several times before my event and he was so anxious to make my event a memorable experience for my guests. They loved him! Randy "Elvis" Walker put on a high-energy, fun, very interactive show for us. His voice is amazing and he really does an impressive tribute to The King. Our entire crowd, ranging in age from 7 to 82, was on their feet clapping and dancing along. In addition to his stellar performance skills, he was a pleasure to work with. The event was a surprise and he went to great lengths to ensure that it would be a memorable one. It was clear from my first interaction with him and he is a professional and experienced performer. I highly recommend him to everyone who is looking for Elvis! We will certainly hire him again when the opportunity arises. Hello Gina! Thank you for making me your Elvis. It was my pleasure meeting you and your family, and working with you to make your event a success. I am a big fan of Randy Elvis! 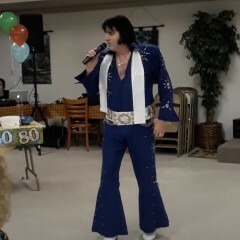 I had a last minute need for a singing telegram for my mom's birthday and Randy Elvis Walker did an awesome job. He was so nice and easy to work with, a great singer and really made my mom happy! Thank you!! Hello Heidi! Thank you very much for taking the time to write the review. Sorry I did not get a chance to meet you. It was my pleasure meeting your mother and her family. It meant a lot to me just watching your mother's surprised reaction and just her enjoying herself. Thank you very much for making me your Elvis. It was very nice working with you and my pleasure. Thank you! Thank you very much! Randy did a great job, we were very happy with his performance. My family and I had a wonderful experience with Randy "Elvis". I highly recommended him. He is very professional and charismatic. My family is a true fan of Elvis, and everyone said that they felt like it was the real Elvis singing. Amazing !!! Thank you for taking the time to write me a Review. Thank you for choosing me for your Elvis. I would like to thank you for your AMAZING performance! For being the highlight of my parents special day, and for making my parents 50th wedding anniversary a memorable event. We were all very pleased with your services and driving half town for us. We highly recommend this Elvis (Randy) look alike..He looks like Elvis, amazing voice, and wonderful performance. Look forward in hiring you again for future events! Thank you! Thank you very much for your review! It was my pleasure meeting you all, and working with you to make your event a success for Rick. It was my pleasure meeting you all, and working with you to make your event a success. I hired Randy for a 102 year old birthday and was so happy with the show he gave. Everyone there was thrilled and the birthday girl was so happy she actually stood up and danced without any help. It sure brought back her mojo. Before the party she was very depressed and wanted to give up. After Randy showed up and did his thing she has a renewed since of love for life. Now she lives for the next party. I can't even begin to tell how great everything was. His attitude, performance, and genuine love for what he does. It all made everything perfect. He spent extra time to talk and dance and greet everyone. He stayed til the end. He enjoyed being there. It wasn't just a job. Thanks for everything Randy. It really made her year. Thank you very much for selecting me for your Elvis and for finding me on GigSalad. Thank you very much for taking the time to write your review. You are correct....I totally enjoyed bringing Elvis LIVE to you all and especially to Lucille. I enjoy working with seniors and watching them enjoy themselves. Lucille is an awesome and amazing lady....SHE ROCKS! Please give her my best regards. Randy Elvis provided the most memorable night for my Mom! I thoroughly enjoyed the show. Randy Elvis Walker was awesome. He has the voice, moves, & chrisma just like Elvis. His interaction with the audiance was great. He was superb. Randy is a warm genuine person. He takes up time with the kids and the elderly. I highly recommend Randy Elvis Walker and his wife Alecia for any show you would like to have. They are very professional and easy to work with. Thank you very much for taking the time to write a review of my performance. Thank you for attending and supporting the event. I am very glad you enjoyed yourself. I do look forward to seeing you at other events. Marlene, Thank you very much for for taking the time to write a review for me. I have to tell you that you are an amazing woman in putting on such a elegant, fun and perfect party. Everything went well and with such details. Thank you for making me a part of your celebration. God bless you and your family. Thank you very much! Randy Elvis Walker. Review by Christy . W.
Thank you Thankyou very much Randy ElviS Walker for performing our wedding ceremony, you were so thoughtful and warm and so ELVIS. You made our day also at the reception, when I closed my eyes , Elvis was actually there! I can't belive how you sound and perform so identical to the king. I would DEFINITELY recommend you to all for ANY event. You really keep it alive, Please add me to your fan club and event list. Alicia thankyou for all your input and ideas. Thankyou Randy Elvis Walker. Review by John . M.
What a eletricfying show!! !Randy Elvis Walker did such an awsome job to where you forgot that your there on such a sad day.Randy what can I say, YOU WERE THE GREATEST, Such a POWERFUL & RICH VOICE, and then you have all the moves,kicks, emotions, etc.... The walls were rattling, there was no better way I can think of to Honor Elvis on the 32nd Annaversary of his Death.You Bring Elvis back to life in our Hearts and Minds. Elvis himself would be totally amazed at all you put in your show. There's no better out there than Randy Elvis Walker. I can't wait till the next show as you put on such a amazing show, Your a total package, what tallent, I can't wait till the next show and get My Randy Elvis fix. Keep up the good work, you do Elvis himself PROUD!!!!!!!!!!!!! John, Thank you for taking the time to write a review. You know I am glad it became a celebration of life. Thank you for attending. We did honor him and celebrate his life, music and legacy. Elvis lives in all of us. God bless! Review by Melodye . O.
RANDY Elvis Walker and his wife Alecia were so sweet kind and showed so much Love and Compassion at my Husbands Funeral, and at the same time they were very professional working with the Funeral Director and Pastor. He sang our favorite songs and helped me so much in my time of greif to make sure that everything was covered and aporiate. He sang with SUCH LOVE AND EMOTION that only Elvis himself could compare. Everyone comented that never in their lifetime have they been to such a LOVING and MOVING Funerl as my Husband's. And the only reason I pulled this off , was not me but Randy Elvis Walker and his beautiful wife Alecia!!! RANDY'S voice was so powerful , strong ,and rich , just like "Elvis Himself" all you had to do is close your eyes and you would not know the difference. I can never Thank Randy and Alecia enough for turning such a sad day into a SPECIAL day. I will no dought use Randy Elvis Walker in all my special events to come , and would HIGHLY RECOMEND Randy to anyone who's interested and wants a great party or event!!!!! Thanks again Randy and Alecia. Randy Elvis Walker sang at the open house I had following my fathers funeral-he was fantastic and everyone was stunned at his performance-he was great. Thank you very much for your feedback and for having me to share in the celebration of your father's life. Thanks to you and your family for your hospitality and for making me feel like family. Price Range: Varies according to location and clients requests. Elvis lives in Randy Elvis Walker...his Charisma, Charm, Voice, Moves, Illusion, Excitement, and his Energetic, Electrifying and Interactive performance keeps the audience mesmerized and asking for more. Randy Elvis Walker has performed on TVs & Radios, at Theaters, Performing Arts Centers, Football Games, Las Vegas, Memphis, Hard Rock, Seminole Casinos, Churches, Corporate functions, Officiates and performs at Weddings, Bat & Bar Mitzvahs, you name it! Audiences are made to feel very special as if they are in the room with the one and only King himself. Experience the King at your event live! Randy Elvis has performed internationally, sharing his energetic, interactive, family-friendly tribute to the King of Rock & Roll with young and old, alike with his Unforgettable Moves. 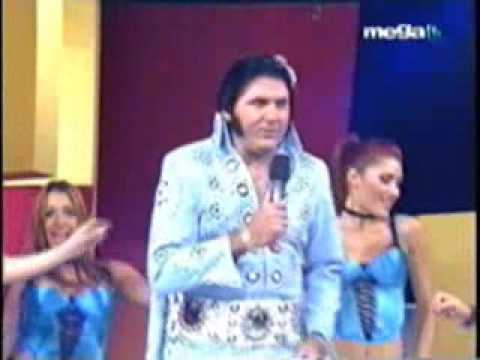 The Voice of Elvis wears Authentic Elvis Outfits. He is Charismatic with his Energetic, Exciting and Electrifying performances. He will Rock Your World with favorites such Elvis hits... "Hunk-A-Hunk-A-Burning Love," "Love me Tender," "The Wonder of You," and "All Shook Up." Randy Elvis Walker leads his audience into a time machine when he steps out on stage. Randy Elvis is an Ordained Minister who officiates at Weddings and performs at Wedding Receptions. Appears on TV, Conventions, Dinner Shows, Hawaiian Luaus, Sports Events, Performing Arts, Concert Halls, Corporate Events, Private events, Churches, Cruise Ships, and Fund-raising events at churches and other venues. Dinner Shows, Hawaiian Luaus, you name it... and he will bring the king live to your event. He has made several personal appearances on TV & Radio, performed at SOLD OUT Performing Arts Theaters, Seminole Casinos, Hard Rock, he sang the National Anthem at Sports games such as Tampa Bay Buccaneers, Miami Hurricanes & Jacksonville Pro's & Con. He was the exclusive Elvis Tribute Performer to perform on the very same stage Elvis Presley performed in 1957 with Frank Sinatra at the World Famous Club Tropigala, Fontainebleau Hilton on Miami Beach. RandyElvis is a people pleaser who enjoys working with people with the satisfaction of watching them enjoy themselves. 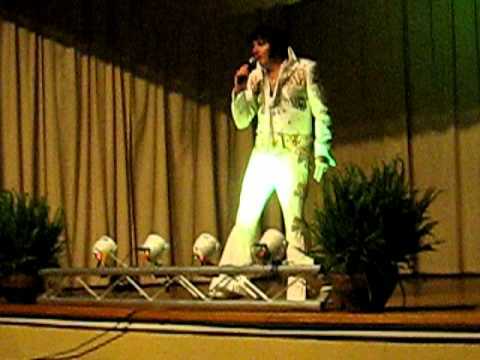 He has been an Elvis Presley fan and performer since he was four years old. Has always respected, admired and treasured Elvis' memory. For this reason, during his show, he works very hard at recreating the king's performance. He began his singing career in churches, for friends and neighbors, the community, and singing with his family's Country Western/Blue Grass Band where he would do the 50's, 60's, 70's, and Elvis music. RandyElvis has become a world renowned International entertainer who has devoted a tremendous amount of his time performing for charities such as American Cancer, Breast Cancer, Muscular dystrophy, Jerry's kids, Tony's Kids in Peru, Relay for Life, to name a few. He has sponsored and given his time and talent for shows to benefit the homeless & needy. RandyElvis has received several plaques & certificates in recognition for his outstanding performances, professionalism, caring and support for many charitable organizations. He has had the opportunity to perform with the Jordanaires in Las Vegas, to perform for Elvis' co-star Chris Noel, from the movie "Girl Happy" at the Ft. Lauderdale Film Festival, also for Elvis’s relatives such as Donna Presley in Las Vegas, Rick Stanley (Elvis’ step-brother), and Harold Lloyd at a convention in Orlando. RandyElvis had the privilege of meeting and singing with the performers of Elvis’ as well as his Entourage including the Imperials, The Jordanaires, Kathy Westmoreland, Charlie Hodge, JD Sumner and The Stamps Quartet, and The Blackwood Brothers at Mud Island, Memphis, TN where they were paying tribute to Elvis on the first Memorial Anniversary. He also met and performed for Karl Perkins‘s at the Omni Daisy Theatre. RandyElvis met, sang, and had lunch with Mr. Sid Tepper at his home. Sid wrote many of Elvis' songs such as "G. I. Blues, "Puppet on a String" and such hits as "I'm Getting Nothing for Christmas" "Red Roses"
RandyElvis Walker’s amazing voice has on many occasions been mistaken as Elvis himself. He sings moves and dresses in authentic outfits like the KING. He was named Florida's top Elvis impersonator, has won many contests & awards. Some of RandyElvis’ most meaningful and memorable performances were at Graceland, Blue Suede Shoes Saloon owned by Carl Perkins, Belle Streets, and other hotels and clubs in Memphis after Elvis’ death. In fact, one of the vendors in Memphis was so impressed with his performances that he gave him an authentic “Elvis in Concert” jacket with the signatures of Elvis, all Elvis’ Entourage including the Jordanaires, and Elvis’ girlfriend Ginger Alden who was with Elvis at that time. RandyElvis also performed on the Jerry Lewis Telethon as the feature performer. He was the featured artist at The 9th Annual Elvis Convention held in Orlando and sponsored by EP Continentals. "Don't miss RandyElvis Walker's live performance!" Randy Elvis Walker will work with you to provide services to meet your needs such as DJ, Band, lighting, staging just for you and your special occasion. Randy Elvis Walker has created various set lists to satisfy any of your special occasion, theme, wedding and your requests. I have been influenced by my love, admiration and respect for the man and his music..Our American Idol, the King of Rock & Roll... Elvis Aaron Presley. DJ, SmallTable, Electrical outlets, variies according to the client and their needs. Hi Randy. I was at the VFW on Sunday evening with my sister. You sat on my lap and sang Let It Be Me and my favorite song you did 2 x was Burning Love. First I want to Thank you and your wife for such a great show. And second I saw that someone was taping the show, I was wondering how I could get a copy of the Disc. I would be willing to pay for it and do you have any Disc of your singing for sale? I would love to hear you again. What you did was so special for the cancer society. You were fantastic better than others I have scene. I saw Elvis twice and you are the closes to him. I hope to hear from you soon. And please send info on fan club. Awesome! I had to such a good time ad screamed myself hoarse. I could not talk even after the show when you took pictures with me. I loved how you arrived in that long limousine which was donated by Jax Party Limos, I got his card. He was really a generous guy to donate his limo and driver for a ride on the town at the auction. You were just awesome from you got out the limo to the end of the show. Your show was the best ever. You were the best Elvis I have ever seen and I have seen lots of them. That was the best three hours with lots of fun. Looking forward to your next show. Randy Elvis Walker! What can I say! Your show was just out of this world...like none other impersonator show I have seen. You are the best! You were just awesome and I am so very thrilled that I was able to attend your show and got to meet you. Will be at the 24th show. Thanks for a fun night. – Sarah J, Daytona Beach. Guys! All I can say is AMAZING! I have seen Elvis twice and I had to pinch myself you were so much like him in so many ways. You definitely had his mannerism, his VOICE, his movies, the outfits, and his charisma. You have it all. I have seen lots of guys impersonate but you do a true tribute to the king. you guys work very well together and put on a terrific show. Thanks for giving me the opportunity to see you. I think this is a wonderful thing you did for the Cancer Society. You will definitely see me on the 24th at the Relay. The King was in the building at the VFW. He truly rocked the place. People were coming in from everywhere once he started and they did not want to leave even after the show. People wanted more and wantedd pictures, cd's and videos. Anything to take with them. WOW! I cannot believe the AWESOME! FANTASTIC, ENERGETIC show you put on. Would not have missed the show and I am so glad I made it. Please let me know of your next perfomance. Thank you Elvis! You were just TERRIFIC! The King was in the building at the VFW. He truly rocked the place. People were coming in from everywhere once he started and they did not want to leave even after the show. People wanted more and wantedd pictures, cd's and videos. Anything to take with them. WOW! I cannot believe the AWESOME! FANTASTIC, ENERGETIC show you put on. Would not have missed the show and I am so glad I made it. Please let me know of your next perfomance. Thank you Elvis! You were just AWESOME! Can't wait for the next show. Hey guys! I was just bursting to tell ya! Randy and Alecia, what a team! You guys are just FANTASTIC! Your work together like a hand in a glove complimenting each other and Alecia attentive to every detals for you. I will not miss your next shows for the world. I have seen lots of Elvis impersonators and none can be compared to you. You cover all the Elvis art of moves, the voice was awesome, the charisma, and the people pleaser, teaser. This shows was the best and you even covered the eras of music. ASTONISHING! AWESOME! Thank you! Thank you very much! Randy your Concert was awesome! absolutely fantastic! out of this world! Your voice, your moves, they way you participate with the people, your charisma. WOW! I have seen Elvis three times and I thought I was with Elvis especially when I closed my eyes. Your voice is just awesome. Your wife was a very good asset to you. She was fantastic and worked with such ease, charisma and grace, very patient and cool. You guys make a fantastic team working together. Elvis was in the house at the Daytona Beach VFW last night. He was amazing! He has the voice, the moves, the illusion, and the moves of Elvis. Oh and his costumes were just awesome and fitted him like Elvis. Our Elvis was very charismatic and lots of fun. I almost missed the show since I had to come from Tampa. I am so very excited that I got to attend. When will be your next show Elvis? Randy's performance was great, he entertain an attendance of aprox. 400 and everyone was impress with his singing and etertaining. He was representing our company on this event, and I have been approched by many of the participants, congratulating us because of his performance. He is just wonderfull!!! Elvis is alive and well. What an exciting night we had, it was so much fun. I would definitely recommend Randy to anybody that loves Elvis. The voice, the moves, and the clothes...Elvis, Elvis, Elvis. Elvis was definitely alive at our event Friday Night! From the suit to the voice... Randy was amazing...his energy was electrifying. All of our guests were really surprised, especially the birthday boy. Thanks for everything! I simply cannot say enough about this performer! If you want an Elvis impersonator, you will not find better! Randy was communicative from the start. Accommodating of our every request. Randy has the look, the moves the costumes and the VOICE of Elvis...I would know, I saw Elvis perform live in Las Vegas many years ago and was a huge fan. He really made our event incredibly special. Our group ranged in ages from 7-65. When he came out, (and I had kept it a secret) people went crazy. Cameras came out, cell phone were texting and sending photos, and the entire time Randy worked the crowd like the true kind hearted professional that he is. I have a sister with Downs syndrome who adores Elvis, has his pictures in her room. Randy paid special attention to her and even danced and sang three numbers just to her. If you had seen the look on her face it was priceless! I will use Randy again in a heartbeat. He is sure to take anyone's event "Over the top". Randy's wife Alecia also deserves mention as she really goes all out to make sure things go smoothly during the performance. Heartfelt thanks to you both! Sincerely, Christine N, Tallahassee FL. Awesome show! Elvis was in the house on our set at MEGA TV. His charisma, his stage presence, his way of working the audience, his Elvis voice and moves were just astonishing. Randys performance was spectacular to say the least. Me and my family enjoyed every moment of it. He's fantastic charasmatic and so very talented i would most definetly recomend him for anyone in need of an Elvis impersonator. Elvis and Alecia made our event! They were very professional and seemed very excited about performing for us and entertaining our guests. They asked for lots of information beforehand and customized just for us. Our somewhat quiet guests had a great time throughout the evening. Even the Grandmothers were up dancing away!! I truely believe after seeing him in person that Randy Elvis Walker is actually "The King"!! Thank you Elvis and Alecia for a wonderful evening!! We'll definitely do it again sometime. We hired Randy for a surprise performance for our parent's special anniversary. My parents (who had seen the real Elvis is 1956) loved him. He put on a great performance, was very accomodating, and had a great voice. We were very happy. WOW! Extremely talented! Incredible! 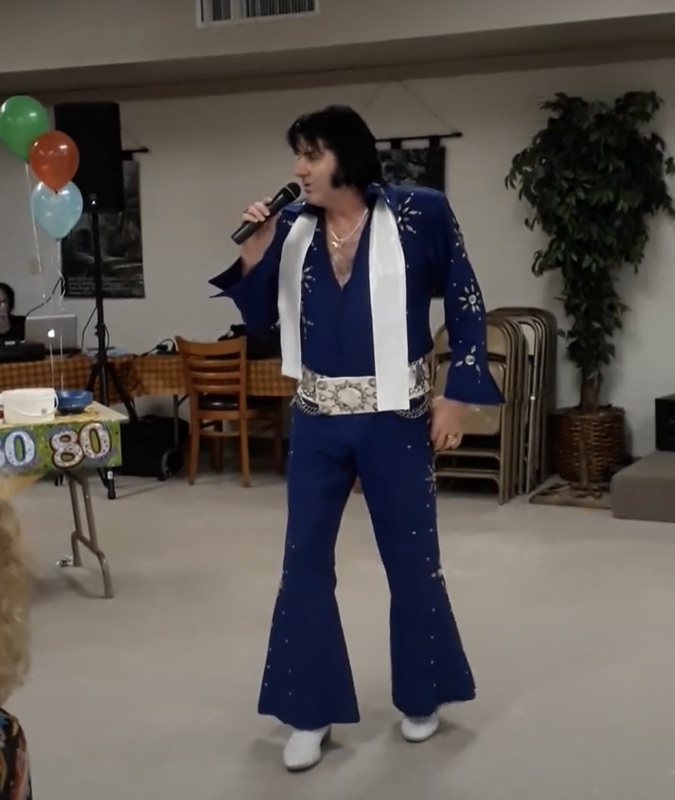 I hired Randy "Elvis" Walker to perform for my birthday party. I had a small gathering of close friends and wanted to do something special for them. I am so glad I chose Randy! He had everyone up dancing having fun and truly enjoying the evening! He was a true gentleman with an incredible voice, showmanship and personality! Good clean fun and entertainment. We haven't stopped talking about it! I would have them back over and over. I am already thinking about my next party. You can't go wrong inviting him to your home for a small gathering or to large function. He will be sure to rock the house! Thank you very much! Dynamite! Randy Elvis was ELVIS at our party. There were guests who had actually seen Elvis in person and were amazed at how much Randy's voice, moves, personality and charisma were perfectly like the King himself. I have received calls the next morning from almost everyone raving about our Elvis and how much fun they had. Randy Elvis will take you down Memory Lane with the King. He was very professional and prompt he even arrived earlier to setup. If you want Elvis and fun, I recommend him without a doubt. Randy performance was GREAT! Sandra, Paola and Roxana can not say enough about how awesome Randy was. We wanted to give our mother a surprise and also something exciting and special. WOW!!!!!!! !we got the right performer. He is a great singer and dancer,and his assistant Alicia was so nice too! They both worked excellent together. We loved his outfits, we loved his moves and of course his voice! Our mother had an unforgettable birthday party thanks to Randy and Alicia. We danced all night and the little ones had fun too! The show was way more than we expected. Thank you gigmasters! Thank you Randy and Alicia we love you! xoxo ELVIS! Randy "Elvis" Walker was truly an amazing performer. The audience was clearly impressed with his vocal ability and stage presence. His performances were full of high energy that drew audience members to dance with him. His wife Alecia did an extraordinary job in stage setup and decorations which provided a "theater" presence. Overall, this event was truly memorable at the South Regional Broward Community College Library. Randy did a great job and was very accommodating. Our group loved him. Randy was a true professional and very compassionate to all the residents. They loved him! I had many, many compliments on his show this Wednesday afternoon. An awesome show! !